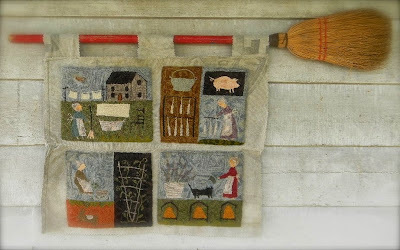 Earlier this spring, Lori Brechlin introduced a charming collection of punch needle patterns called the Farm Chores Series. I am happy to say that they are now rug hooking patterns as well, available through Spruce Ridge Studios! The size of all four patterns are 25.5" x 20". The cost is $40.00 on monks cloth and $51.00 on linen. They are not listed on my website just yet but you may place an order by phone or mail, and they are also available at my store in Holly Hills Primitives. Farmer and His Wife...and Spring Cleaning...or Feeding the Chickens! Absolutely perfect for your primitive farmhouse look!